In front of the beautiful backdrop of mesmerizing Kirtimandir well known male artists perform on stage and mark their presence in one of the unique events ever happened in Vadodara. Artists from all across the country perform with an aim to raise funds for the betterment of underprivileged women in the city. From planning to execution the event ‘Natt Paurush’ carries it uniqueness and set a benchmark where probably for the first time male artists performed on stage to raise funds for women. Witnessed by art lovers from the city the event was a treat to watch as performers set the tune on beautiful cold Saturday evening. 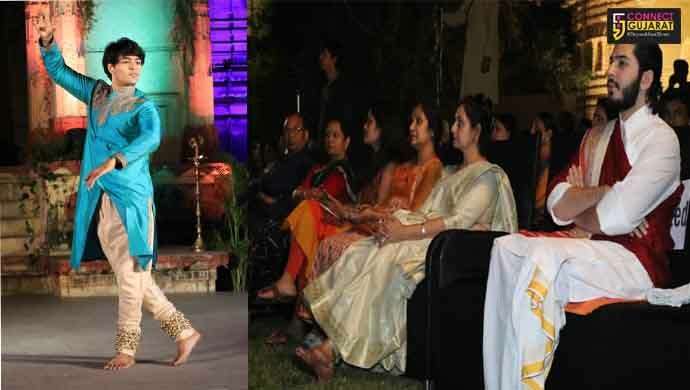 Organised by Poetry Tales the unique event named ‘Natt Paurush’ featured eight renown artists from across the country perform on stage raising funds for women empowerment. Artists like Durgesh Gangani, Anubrata Chatterjee, Abhishek Mallik, Shikhar Nad Qureshi, Bhupesh Gangani, Iyaz Khan and Sandeep Gangani perform on stage and collect funds for the cause. The show also features the traditional as well as contemporary styles to give it a fusion look but maintains the essence of the cause behind this.